Small, smooth stones (or ceramic squares) onto which words, signs or symbols are painted or written. Small, unusual objects (e.g. toys, things from nature, household items, small bits of clothing, coins, and so on). Slips of paper or flat sticks with words or pictures on them. Cubs work in groups of 3-5. The Den Leader can start off with a beginning, then allow one of the group members to "set the stage", or leave it completely up to the individual storyteller from the very start. The first Cub begins by drawing out an object from the box without looking (the element of surprise makes it more interesting!). The drawn item must be used sequentially in the story and stays out of the Box until the story is finished; i.e. it can't be put back into the box and exchanged, or saved until later in the story, or used again. The story continues until such time as the Cub becomes "stumped", and pulls out another object. This process continues until the Cub determines that the story is finished. * A report on a recent den field trip. * Brief impression of a recent den or pack event. * Directions for playing the writer’s favorite game. * A report on an interview with the den leader. * A one- or two-paragraph description of each den member written by himself. * An interview with the den chief, who tells why he likes Boy Scouting. * A story on what the den plans to do for the Blue and Gold Banquet. If you have an artist in the den, he may want to draw a cartoon or some other illustration. A boy interested in photography might choose to take photos of den activities. Recruit boys and parents who have access to a computer to help produce some or all of the newsletter electronically using graphics and word processing programs. Potatoes make good block prints, if used right away. They are easily carved, but last only a day or two. One potato makes at least two designs. * Blot the surface to remove as much moisture as possible. * With an orange stick or pencil, trace design on potato. * Cut away all parts without any design on them. Cut outline at least 1/3" deep to provide a good printing surface. * Again remove additional moisture. * Place paper to be printed on a pad of newspaper or a water-soluble printer's ink on design. * Transfer potato design onto paper. Press had but do not move the potato or the design will smudge. You can make the potato stamp in a couple of ways. One way is to cut the potato in half and carve a design on one-half. This should be a raised design, so you cut away what you do not want to see. There is a safety issue here of using knives. Plastic ones work if the potato is a softer variety. Another way to potato stamp is to use cookie cutters. You push the cookie cutter all the way into the potato and cut off the excess with a butter knife. This can make better shapes and is a lot safer for the Cubs. Trees shrubs, flowering plants and weeks offer an infinite source of leaf designs for printing. Use an inked stamp pad, place leaf, veins side down on pad. Lay a piece of newspaper over leaf and rub fingers over it. Remove leaf and place it on surface to be printed. Pace clean newspaper on tap and rub. Place leaves veins side up on paper or textured surface, such as burlap, wood or leatherette. Cover with sheet of plain paper and rub crayon held sideways. Outlines and veining of leaves will stand out. On a dry plastic sponge draw or trace your design. Cut cleanly along the lines. Place poster paint in a dish, brush the paint onto the flat part of the sponge and stamp it on your paper. Draw your design on a gum eraser. Use a craft knife or scissors to cut away the part around the design so the pattern is raised. Have a basket full of words that you have cut out of the newspaper. Hand out a piece of 8 1/2" X 11" paper to each boy as well as a roll of scotch tape. By picking words out of the basket, each little editor combines words to create his own newspaper headline. Write a short story based on your "Headline." Without careful observation, it is hard to notice the many different things in the newspaper. Nick K., "Cub Reporter,” amazes his friends with his ability to find lots of hidden things written in the paper. Let's see how well you do! Use the newspaper to find words for each category and letter listed on the chart below. When you find a word that starts with one of the letters and also fits in a category, cut it out; the glue it in the appropriate box. Shrink-It kits can be found in craft stores. This slide uses Shrink-It. Shrink a story from the newspaper to size you want. Glue it on cardboard and cover both sides with clear plastic. Glue pipe cleaner on back. Materials: One large craft stick (tongue depressor); 1 spring-type clothes pin; Markers; Glue; Strip magnet. 1. Glue a clothespin near the end of the craft stick. 3. Attach magnet on back. Materials: One paint stick (for quart or gallon can, about 14” long); Several spring-type clothes pins, Paint; Permanent markers; Glue; Strip magnet. 1. Paint the paint stick. Use any wood or acrylic paint. 2. Attach clothespins. If desired, paint or decorate the clothespins before you glue them on the paint stick. 4. Attach magnet strips on the back of the paint stick. Materials: One craft stick (tongue depressor); Sandpaper; Yarn; Raffia; Twine; Plastic lacing; Small piece of cardboard; Permanent marker; Shellac (optional). 1. Sand one end to a point--not too sharp! 2. Sand both edges until they are angled and smooth enough for opening letters. It’s easier if you move the craft stick over sandpaper than the other way. See Picture above. 3. Wrap the handle end with yarn, raffia, twine, plastic lacing, or other material. Wrap about an inch and fasten the end. Put a dab of glue on each end to prevent unraveling. 4. Fold the cardboard, draw a small, simple design. Cut both layers. Glue them over the top of the handle, one on each side of the stick. 5. Draw design on the stick with markers. 6. Finish with a coat of shellac (adult assistance necessary). 1. Sand the surface of wood pieces well. 2. Use one for the base. Glue a piece of felt to the bottom. 3. Saw the other piece in half and glue the straight edges of these halves across the base, leave space between for letters. Make a small hole in the base of each cup. Insert one string from the outside to the inside of each set of cups and secure it with a piece of tape. Let the Cub and his partner talk to each other. Be sure to keep the string taut but don't pull so hard that the string comes untaped. Suggest they have a code word to indicate they are done talking, so each knows when to change from listening mode to speaking mode. Create a message center using a wooden coat hanger and metal cup hooks. Screw the cup hooks into the bottom of the wooden coat hanger, spacing them equal distances and using one for each member of the family. Decorate the hanger any way you want, using Feathers, ribbon, seeds, dried flowers, material, etc. * Using supplies, assemble, as illustrated. * Bend the metal “Z” (sounder) so that it attaches itself to the nails when the key is pressed. 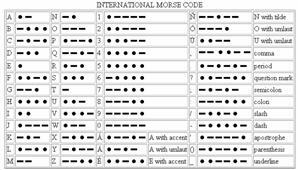 * After the boys have completed their old fashion telegraph set, they can have fun sending messages to each other using the Morse Code chart below. On May 24 2004, the 160th anniversary of the first telegraphic transmission, the International Telecommunications Union added the “@” (the “commercial at” or “commat”) character to the Morse character set and is the digraph “AC” ( probably to represent the letter a inside the swirl appearing to be a C). It is notable since this is the first addition to the Morse set of characters since World War I probably, due to its popularity in e-mail addresses. * Pile at least five pages of newspaper together. 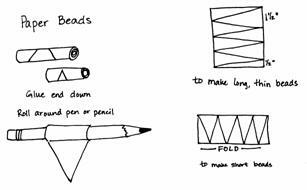 * Fold them in half (so they are about 11 x 14) and roll them up lengthwise. Make sure that the roll is tight. * Fold another page in half and wrap it around the roll. * Tape them all together. * From the top of the roll, make cuts about three inches long and 1/2 inch apart to make the hair. * Draw eyes, nose and mouth on the white paper and cut them out. 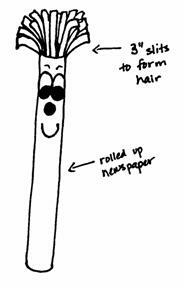 Glue the facial features on the roll just below the hair. * Find colorful pages in the magazines and cut them out. * Cut triangle shapes the length of the page, having the widest part of the triangle 1/2 inch in width. * Starting with the widest end of the triangle, roll the triangle around the pencil or stick. 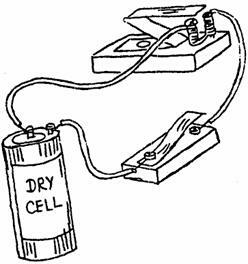 * Put a drop of glue on the point and hold it in place for a few seconds to secure the end of the triangle around the roll. Make several beads and then string them on a string to form a chain or necklace. * Cut pictures from magazines, wrapping paper, comics, or other thin paper. * Mix the gelatin as follows: one part gelatin to two parts boiling water. For example, use 1 teaspoon gelatin to 2 tablespoons boiling water. Let the mixture cool one minute. * Use a paint brush to completely cover the back of the pictures with the gelatin mixture. Dry on a piece of wax paper. * When the mixture dries, you can lick the pictures and stick just like stickers. Practice your phone skills by holding the meeting over the phone. Set up a telephone schedule the previous week with the time that each boy is to call another. Give each boy a message to give to the others a week ahead of time. Put it in a sealed envelope and put them on their honor to open it only on the day of the calls. On the day of the stay-home meeting, the boys should open their envelopes and keep their calling schedule. They should write down the messages that you gave them to share with one another. Have them bring the messages with them to the next den meeting. Compare the messages that the boys wrote down with the messages you gave them. Discuss how communication breaks down and how they can make it better. If a boy is missing or you do not have eight boys, work with another den or give byes to those who have no one to call. Materials found at the U. S. Scouting Service Project, Inc. Website ©1997-2004 may be reproduced and used locally by Scouting volunteers for training purposes consistent with the programs of the Boy Scouts of America (BSA) or other Scouting and Guiding Organizations. No material found here may be used or reproduced for electronic redistribution or for commercial or other non-Scouting purposes without the express permission of the U. S. Scouting Service Project, Inc. (USSSP) or other copyright holders. USSSP is not affiliated with BSA and does not speak on behalf of BSA. Opinions expressed on these web pages are those of the web authors.